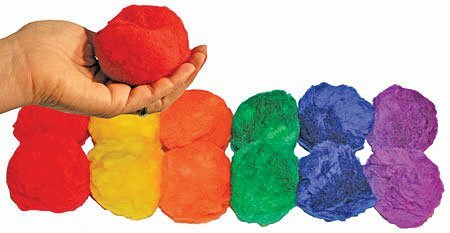 Our Softball sized Rainbow Fluff balls are made from a lightweight fleece material that makes them fly slowly, easy to catch and completely non-threatening. Besides simply throwing and catching, use these Fluff Balls for introducing badminton or juggling. Each dozen consists of 2 each of the following colors: red, blue, yellow, orange, purple and green. Crocodile Creek Playground Ball with Bunnies, Pink, 7"